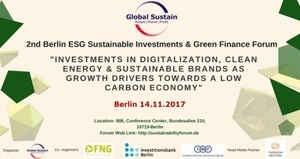 17.10 - 17.25: 1st Keynote Speech: Michael Spanos, Managing Director, Global Sustain Group, Yannis Salavopoulos, Managing Director, Global Sustain GmbH (CEO, CCG GmbH) on the "Future of ESG Responsible Investments & Green Finance. From Theory to Praxis. A disruptive Approach"
17.25 - 17.40: 2nd Keynote Speech: Claudia Tober, Managing Director, FNG on "ESG Responsible Investments Market Trends in Germany & DACH Region"